If you have low vision, eyeglasses, contact lenses, medicine, or surgery may not help. Activities like reading, shopping, cooking, writing, and watching TV may be hard to do. The leading causes of low vision and blindness in the United States are age-related eye diseases: macular degeneration, cataract and glaucoma. Other eye disorders, eye injuries, and birth defects can also cause vision loss. Whatever the cause, lost vision cannot be restored. It can, however, be managed. A loss of vision means that you may have to reorganize your life and learn new ways of doing things. If you have some vision, visual aids such as special glasses and large print books can make life easier. There are also devices to help those with no vision, like text-reading software and braille books. The sooner vision loss or eye disease is found and treated, the greater your chances of keeping your remaining vision. You should have regular comprehensive eye exams by an eye care professional. 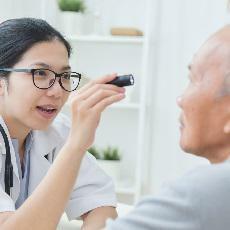 Article: Acute Visual Disorders-What Should the Neurologist Know? Article: Computer Vision Syndrome: Darkness Under the Shadow of Light.